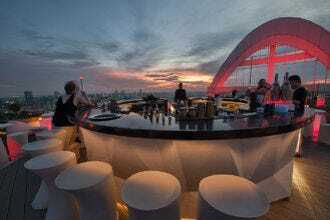 While beer drinking is age old in Bangkok, it used to be limited to 3.5 liter towers of Chang and Singh served in raucous beergardens that had little variance in terms of theme, design, and vibe. All that has changed massively, both in place and taste. Bangkok now has superb beer, although you will pay dearly for it due to the excessively high customs duties and alcohol taxes. 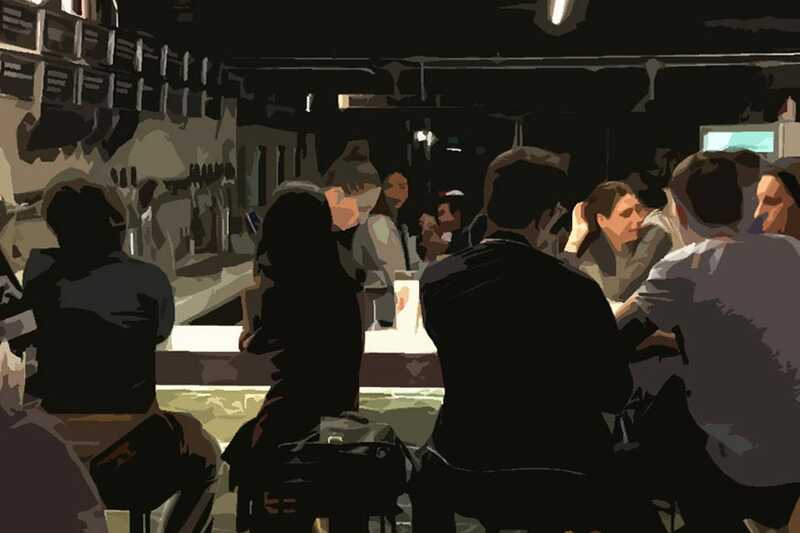 Places like Mikkeller, Pijiu, Hair of the Dog, Bottles of Beer, CRAFT, and Wishbeer Home Bar have changed the face of brew here, serving up superb craft beer offerings, both on tap and in the bottle. These brew pubs, along with newcomers Mash and rooftop venue Brewski head the list of a growing number of chill out spots serving American and European craft or micro beers. Local Thai craft brewers like Golden Coins Taproom are also hot on the scene, and they get around the draconian anti-brewing laws for small pubs by having their beer made in Vietnam and then sent on over. Tawandang Pub actually makes their own beer, one of the few places licensed to do this, and while it isn't really craft beer, it's a fun place to go for drinking, eating, and dancing. 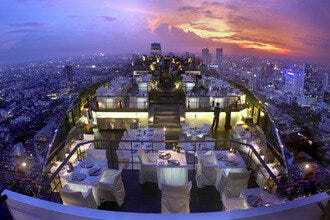 One thing is for sure, you wont be shortlisted anymore when it comes to beer drinking in Bangkok. 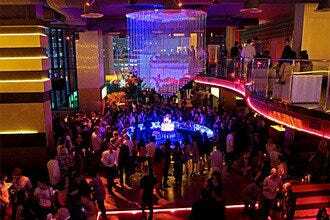 What started out as a German microbrewery has morphed into one of Bangkok's best all encompassing entertainment venues. Now at two locations, the original Tawandang still combines a country western pub complete with excellent ribs and tasty micro beer along with a very Thai music vibe, featuring live rock and pop acts each night, along with providing a giant dance floor for the sated diners to work off their dinners. 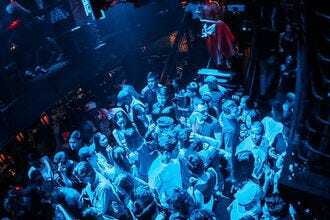 It gets very lively in here and is an excellent insight to the Thai live music world, not to mention just a great spot to dance your *** off! 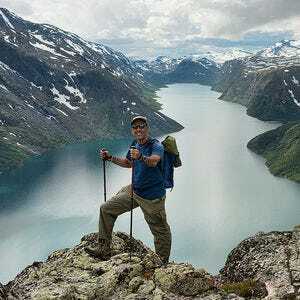 The beer here certainly isn't "craft," but the fun scene makes it worth the trip alone. 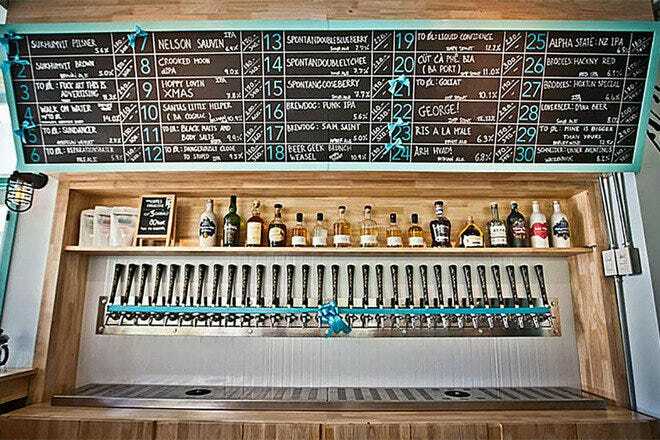 With 12 taps offering up Golden Coins own varieties of craft beer, local Thai craft beer looks to be here to stay. The brick interior pub hidden in a corner of the Ekkamai Mall is run by "Pleak" Pumpo, who was behind the now defunct Let the Boy Die micro pub in Chinatown. Pumpo gets around the draconian Thai laws against brewing beer by having his brew fermented in Vietnam and then sent over to Bangkok. One of these days, it will be made here, but for now, this is as close as you'll get to "legal" home brewing here. There are a range of flavors to opt for, from stouts to IPA's to pale ales, and you can feast on burgers, steak, fish and chips, and Thai bites to go with your suds. The folks behind Beervana, the craft beer curatorship, and Whisgars, the cigar and whiskey bar, got together to create CRAFT, which started as a popup beer bar, and went on to have 20 rotating taps of fine craft beer. 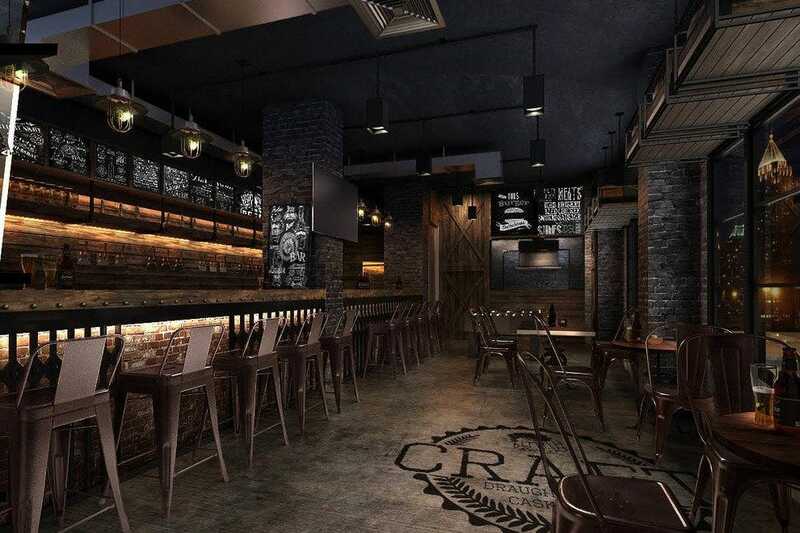 They have now expanded across town, with the new CRAFT, a full fledged pub that features over 100 bottles of craft beer from around the world, along with 20 rotating taps from craft brewing giants like Nogne O in Norway, Baird in Japan, and American stalwarts like Anderson Valley, Rogue, and Deschutes. The pub also has live sports on, and is a great place to meet like-minded beer aficionados. If you don't want to make the trek all the way across town and you are staying on Sukhumvit, you can hit up their smaller bar which is on Sukhumvit Soi 23. This hole in the wall pub has more space for beer than customers, but that is just fine, as their selection of bottles of craft beer and cider from around the world is simply outstanding. You sit around a long rectangular table, gape at the fridges and shelves full of both Thai and international crafts, and save your money by ordering six or more (which can be combined between friends), which gives you wholesale prices, pretty much unheard of in Bangkok. Added pluses are the owner's most well behaved chihuahua in the world, which makes the rounds to all drinkers, and the roast chicken vendor outside, who brings in rotisserie grilled chicken once you've worked up an appetite. 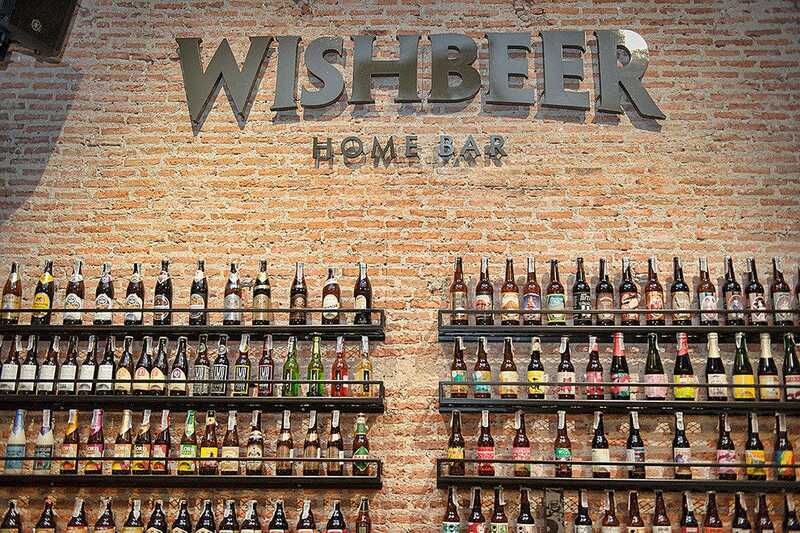 Wishbeer got its start when French owner Jerome Le Louer and several friends started dreaming of all the beers from home they loved to drink but couldn't find in Bangkok....which led Le Louer to do something about it, namely by opening his own online beer delivery service, www.wishbeer.com. 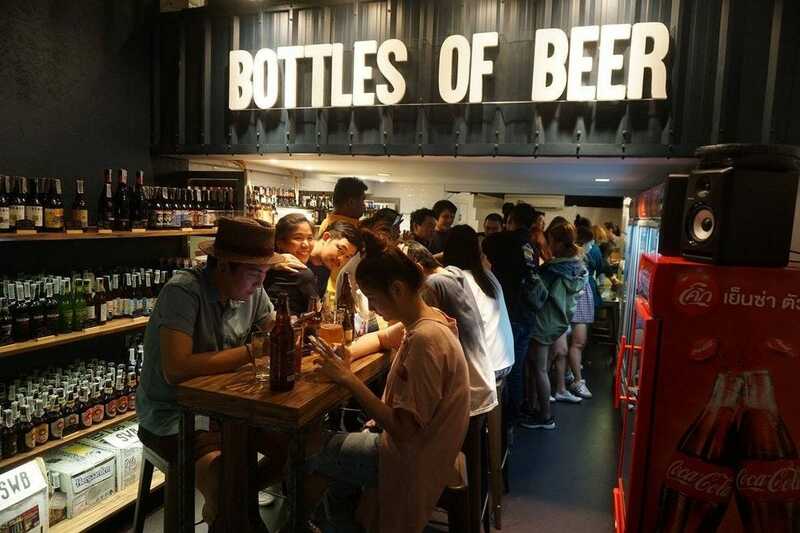 This expanded to the idea of having a relaxing sit down bar where one can not only enjoy some great beers on tap, but also take home any of the 500 plus bottles of beers and ciders from around the world that is part of Wishbeer's extensive collection, one of the largest in Thailand. 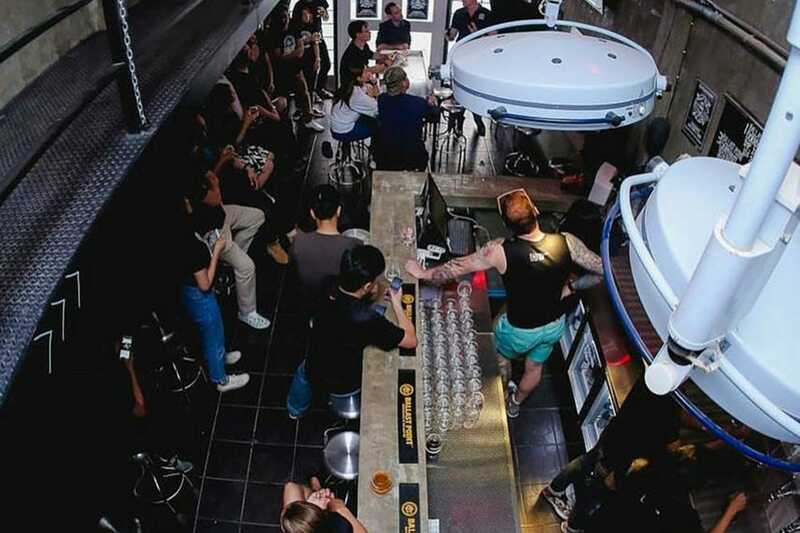 Located in a former elevator factory warehouse, Wishbeer is a fine spot for chilling out and sampling the 18 different beers on tap (which rotate every month), including Belgian or popular craft beer selections. As Le Louer comments, "Only 20% of the 500 bottles we stock can be found in supermarkets" making it Bangkok's most extensive beer shopping and drinking spot around. The happy hour prices here also make it Bangkok's best craft beer bargain, so make sure to come in early. 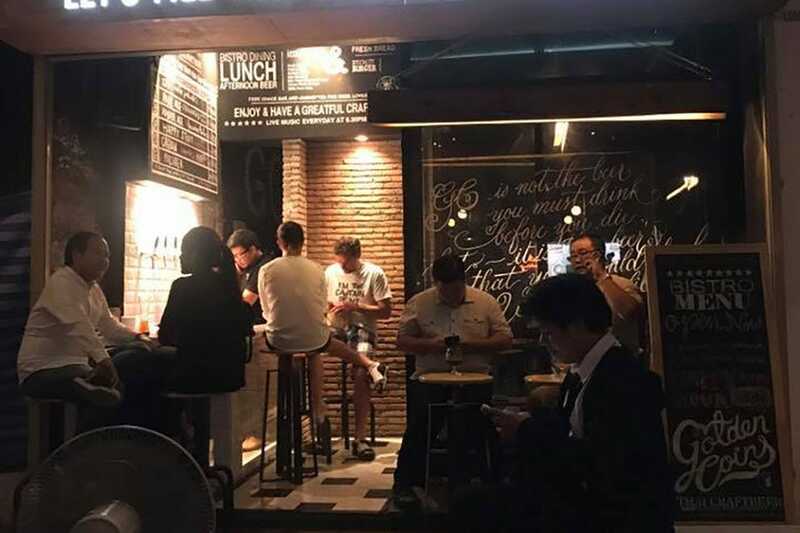 While Silom Road has plenty of nightlife, restaurants, and bars, the massive craft beer scene invading Bangkok hasn't really taken firm hold here, and Mash is a welcome addition to the busy dining scene on Soi Convent, just off Silom. Mash (yes they do serve American comfort food including mashed potatoes, although the mash might refer to the beer brewing process' "mashing" technique) has 16 rotating taps of craft beers, along with bottles of some excellent brands, such as the American Ballast Point, or Rogue breweries. Ladies will love it here on Tuesdays, when they get a buy one get one free special all night. There are also Belgian beers, several Thai craft beers on tap, and the list gets bigger every time you visit. Burgers, pork ribs, and chicken wings give all the more reason to come make a full night of it here. 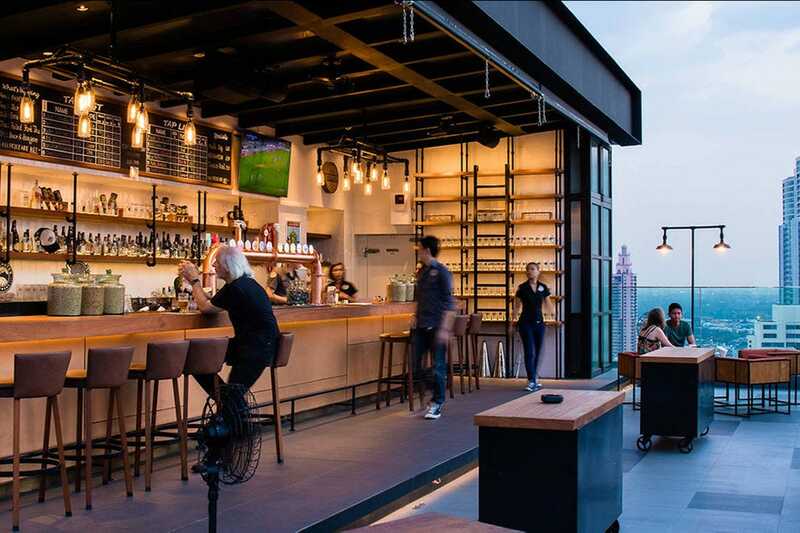 Rooftop drinking is a big part of the Bangkok nightlife, and now craft beer aficionados have their own place to pound good beer. 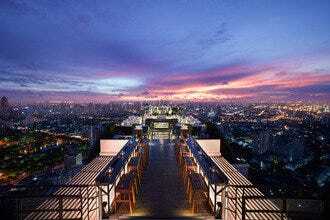 Up on the 30th floor of the Radisson Blue Hotel the bar overlooks the lights of Sukhumvit and features 12 rotating taps of craft beer and ciders, along with an incredible array of over 100 bottles from around the world. In addition to the suds they have burgers, fish and chips, Thai delights, and plenty of appetizers to munch on. A state of the art cooling system ensures that the taps are kept cool, and if you can snag a coveted lounge sofa seat you might find yourself passing the night away here. 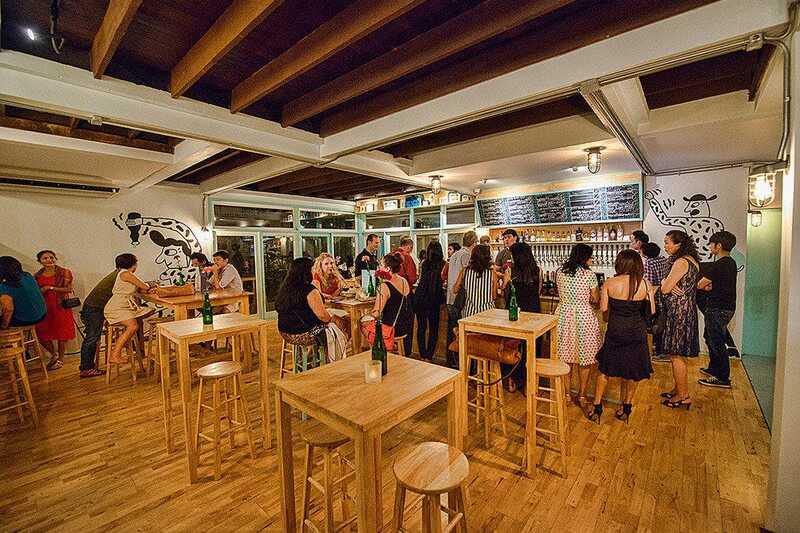 With 30 taps and specialised bottle selections from around the world, Mikkeller has burst onto the Bangkok craft beer scene with a vengeance, and has to be on any craft beer lover's list. The array of great boutique beers here is staggering, and the laid back brew pub, started by a couple of Danish beer lovers who worked for Carlsberg in Thailand, run their own import beer company, and now are doing their own craft thing, is one reason why the hip Ekkamai neighbourhood continues to lead the high end alcohol craze taking over the city. Mikkeller puts on plenty of special event nights, both in terms of beer specials and inviting expert brewmasters from around the world in to show their stuff, and for those who want to just kick back and relax, the garden setting here is perfect. 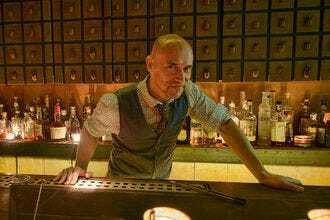 Call it a craft beer lover's speakeasy if you'd like, Hair of the Dog raises the bar on fine craft beer with its 13 rotating taps of some of the best craft beer from around the world. It's in the class of Bangkok brew masters Mikkeller, but in far more intimate surroundings, basically just a counter full of stools that encourage plenty of interaction with the knowledgeable "beeristas" behind the bar. Prices don't come cheap here, but they do have a ladies half price night on Wednesdays, plus some happy hour specials before 6. There is also a second branch which is just as small over in Mahatun Plaza at Ploenchit. 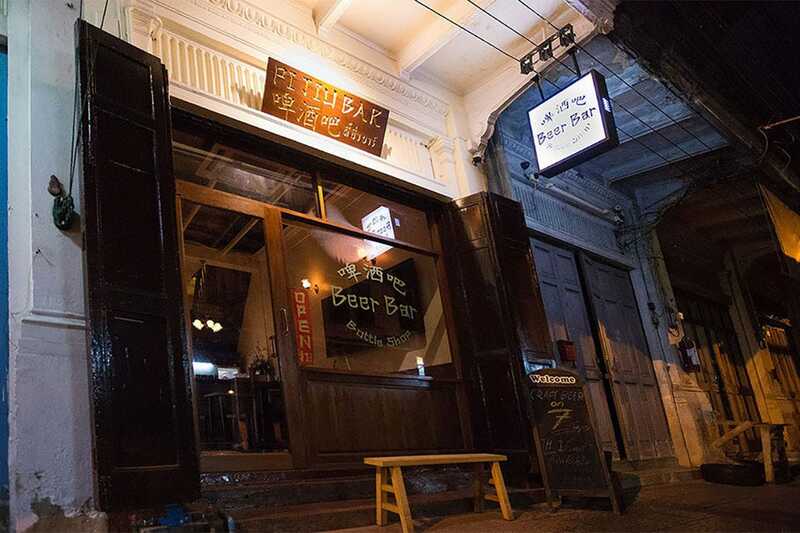 Soi Nana, a small lane on the fringes of Chinatown (not to be confused with the red light area of Nana on Sukhumvit), is leading the way for cool retro-style hangout bars coming to this older part of the city. 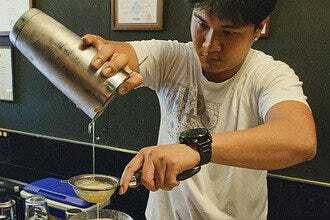 While most of the bars here focus on creative cocktails, craft beer is now well represented in the neighborhood with the arrival of Pijiu, named after the Chinese word for beer. Pijiu is brought to you by Beervana, the craft beer distributors who have been a major player in the Thai craft beer craze, and you'll find plenty of U.S. staples like Stone, Deschutes, and Anderson Valley.alongside of some of the best Thai craft favorites. The bar has a retro-jazz look, and makes for a welcome change from the often pretentious beer hangouts over on the Thonglor and Silom sides of town.